A Desk That Can Take A Ton Of Earthquake Rubble : Goats and Soda It's fairly light, costs $35 per student and could save lives in earthquake zones. But not everyone thinks this quake-proof desk is a good idea. 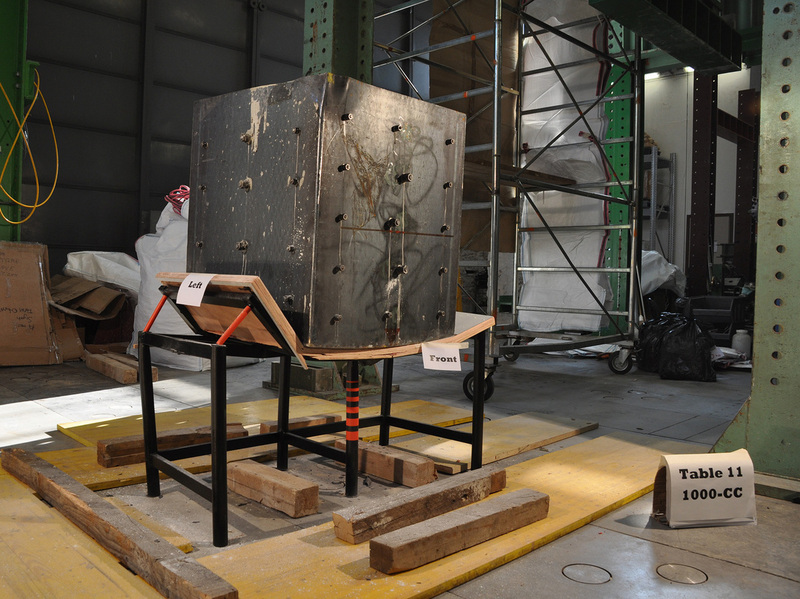 Still standing: The earthquake-proof desk can withstand 2,200 pounds dropped on top of it. Call it the little school desk that can. At 57 pounds, the desk in question is light enough for two students to carry and move around the classroom. At $35 per student, it's affordable enough for many school districts to buy in bulk. And oh yes, tests have shown it can survive a crushing weight of 1,000 kilograms (2,200 pounds) or more. Building an earthquake-resistant desk was the brainstorm of Arthur Brutter, who came up with the idea in 2010 for his senior project at Bezalel Academy of Arts and Design in Jerusalem. After graduation, he continued to work on the desk with his professor of industrial design, Ido Bruno. The reasoning behind the desk's usefulness goes like this. The general advice for students in the event of an earthquake is to duck under their desks. But if the furniture isn't sturdy, "duck and cover" won't necessarily help, Bruno points out. From the start, "we were thinking how this could help in a country with problematic buildings — that is, one- or two-story buildings that were not built to hold out in an earthquake," Bruno says. Such structures are especially prevalent in older cities and across less wealthy countries along earthquake rifts and fault lines, such as Jordan, Turkey, India and Nepal. Indeed, an estimated 5,000 schools were destroyed in Nepal's back-to-back earthquakes. The desk is made of wood and steel tubes. So how can it absorb up to a ton of impact, as tested by the engineering department of Italy's University of Padua in 2012? The steel creates a framework that can absorb and spread the impact, Bruno says. Now it may be used in an actual earthquake zone. About two months ago, Bruno met Brian Tucker, the founder and president of GeoHazards International, a nonprofit that helps developing countries prepare for natural disasters. Bruno, Brutter and Tucker are working on a proposal to bring the desk to schools in earthquake-prone Bhutan. Part of the plan would include training workers to manufacture the desk there — which could help the economy. Other earthquake-resistant desks are already on the market. But they tend to be reinforced with thick steel plates, making them too heavy for students to carry. And they often carry a hefty price tag to match. By contrast, Bruno says what he and Brutter designed is more affordable for poor countries or municipalities, especially when you compare it to other earthquake solutions, such as building a new school or strengthening the existing structure. "That would cost anywhere from seven to 14 times as much as buying the tables," Bruno says. Not everyone is enthusiastic about the desk. "The idea of stronger desks to protect students in earthquake-prone areas is no substitute for assuring that school buildings themselves will not collapse," says Marla Petal, a senior adviser for disaster risk reduction for Save the Children. "The only effective way to ensure the safety of children is to build or retrofit school buildings to well-established standards of earthquake safety." In principle, Brian Tucker of GeoHazards agrees with Petal: "The long term solution is to build or retrofit schools in accordance with modern building codes," he writes in an email. But the desk, he explains, is a cost-effective alternative for the short term. According to Tucker's estimates, it would cost approximately $1,500 per student to build an earthquake-resistant school, as opposed to approximately $35 per student for each desk (with each $70 desk accommodating two students). From his point of view, "the 'earthquake-strong' desks gives cash-strapped policy makers and international development agencies more options to choose from." Even in earthquake-safe buildings, objects often fall from above, Bruno adds. This desk could protect students and reduce or prevent injury. But even a simple desk isn't easy to produce. To become reality, the proposal will require coordination among many different sectors, Bruno says, including Bhutan's Ministry of Education, potential manufacturers in Bhutan, the nonprofit GeoHazards, the Israeli company that owns the license to the desk and perhaps additional funders to support the project. Meanwhile, Bhutan is expected to have a large earthquake in the next few years.